Home / Batman / Batman-v-Superman / Ben-Affleck / Henry-Cavill / Movies / Superman / 7 Best Parts of "Batman v Superman"
1. Lex Luthor - Many have said they found Lex Luthor weird, twitchy, babbling, and just plain annoying. To which I say, that's exactly why I liked him. Lex has pretty much always been presented the same way: arrogant, confident, imposing, and self-controlled. I thought Jesse Eisenberg's Lex broke the mold in the same way Heath Ledger's Joker did. I found myself thinking, "Yes, Lex in Batman v Superman acts crazy. Because he is crazy. He's a mad scientist." Anyone who would think it would be a good idea to create an unstoppable alien monster to kill Superman would have to have a few screws loose. It also made Lex unpredictable, which I found scarier. 2. Batman - Many feared that Ben Affleck would be a disaster as Batman. I thought he did a good job. He wasn't perfect. He didn't disappear into the role the way Christian Bale did, playing Wayne more as Ben Affleck in a Batsuit. But he was just as imposing and powerful and strong. He had an aged gravitas, like a man of power, but with the weariness of a man who faced decades of brutal supervillains. The moment when he single-handedly took on a band of soldiers to rescue Martha Kent, and when he faced off against Superman truly delivered. 3. The Justice League - With the subtitle Dawn of Justice, we knew this movie would set up the Justice League. But how? Going in, I wondered how they were going to work in so many characters. Would tossing in the Flash and Aquaman leave the movie a Spiderman 3-level disaster of tangled plotlines and undeveloped characters? The scene where Diana Prince views video clips of the other heroes was understated, but effective in teasing the way they would be presented in later movies. There wasn't enough Wonder Woman, but that's okay. She'll have her own movie in 2017. 4. The Easter Eggs - If there's one thing comic book fans love, it's Easter eggs, those small little details that reference other comic books. And BvS had a ton of them. To list them all would take too long, but I loved the moment when Batman clung to a wall while lightning crashed behind him referenced The Dark Knight Returns. And I almost squealed like a little girl when I recognized uber-villain Darkseid's winged parademons in Wayne's vision of a dystopian future. 5. The Philosophy - In a popcorn movie blockbuster, you don't expect things to get too heavy. But BvS did. The movie grappled with philosophical questions about power and the role of superheroes in ways never before seen in movies. Even Watchmen, arguably the granddaddy of all superhero deconstruction movies, never tapped into it the way BvS did. When Superman's statue is painted "false god," when people literally kneel and bow to Superman as he goes by, we can see how the world is struggling with his image. The government fears him and his power, holding hearings on how to control him. And Superman stands above it all, uncomfortable with being deified. Batman and Lex see his power as a threat in ways that we can't really argue with. The only problem is that the movie raised the questions without answering them one way or the other. 6. 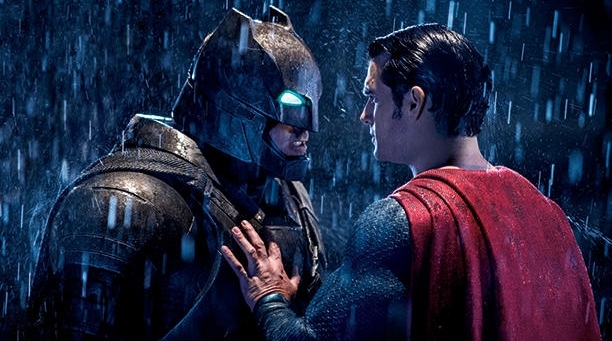 The Fight - With all the somewhat valid complaints, I still enjoyed the actual fight between Batman and Superman. Because it was awesome. When Batman unleashed gun turrets on Superman, and Superman ripped the doors of the Batmobile, it really led up to the excitement. Seeing the two of them pounding each other, Batman spraying Superman with kryptonite and sucker punching him, Superman hurling Batman through walls and ceilings, it all paid off. I loved every second of it, and that's really all I came to see. Everything else was just gravy. 7. The Ending - [LAST SPOILER WARNING] And now Superman is dead. I wasn't sure if they would do that, but thought they might by bringing in Doomsday, who killed Superman in the comics. The scenes that followed with funerals for Clark Kent and Superman perfectly captured the grief of a world without him. Okay, I didn't cry, but some people in the audience I saw it with did. It was a gutsy move, as tough as Superman killing Zod in Man of Steel. It also perfectly sets up the Justice League. With Superman around, you don't really need Aquaman. Without Superman, other heroes will have to step up to fill the power vacuum, especially if Darkseid really is the villain in the next movie. What did you like or dislike about Batman v Superman? Update: The original version listed 5. The final version is 7.